The Army Corps of Engineers published a news release today about tentatively selected plan. It lists the total cost of the projects at $41 million. This information was not available when I wrote my story for Sunday’s Kitsap Sun. Residents in and around the Skokomish Valley have demonstrated incredible patience, along with some frustration, while waiting for the Army Corps of Engineers to develop a plan to restore the Skokomish River. I was pleased to announce in today’s Kitsap Sun (subscription) that top officials in the corps have now approved a “tentatively selected plan.” This plan will now undergo extensive review inside and outside the agency. Two public meetings are being planned, although they have not yet been announced. 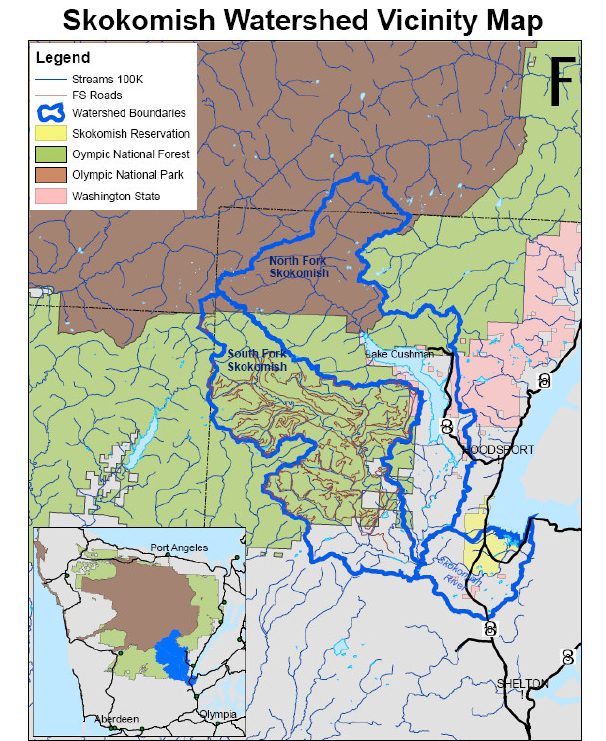 I’ve been following the development of this plan for many years, actually long before I wrote a four-part series in 2009 about the past and future of the Skokomish River. See “Taming the Skokomish,” Kitsap Sun. Rich did not slam the Army Corps of Engineers for taking so long. He and I did not discuss — as we have in the past — how restoration of the Skokomish River plays an important part in the restoration of Hood Canal as a whole. But we did talk about dredging, which many area residents believe is the only answer to cleaning the river channel, clogged by sediment and flooded more frequently than any river in the state. The corps has determined that dredging is too expensive for the benefit provided and would require ongoing maintenance. I look forward to reading the analysis by the corps and hearing the discussions that follow. I’m sure there is plenty to be said. Before the agency releases the tentative plan, a final check must be made by corps officials to ensure completeness of the documents, which will include a feasibility report and an environmental impact statement, according to project manager Mamie Brouwer. Car-body levee removal: Years ago, junk cars were used to construct a levee where the North Fork of the Skokomish flows into the main river. Although the course of the North Fork has changed, the old levee continues to impair salmon migration through the area, Brouwer said. This project would remove the levee and restore the natural flows at the confluence. Side channel reconnection: Restoring a parallel channel alongside the Skokomish would give fish a place to go during high flows and flooding. In recent years, migrating salmon have been washed out of the river and into fields and ditches, where they struggle to survive. A side channel, about 4 miles upstream from where the Skokomish flows into Hood Canal, could provide refuge from the raging river. Nine mile setback levee: A new levee is being proposed nine miles upstream to allow an existing levee to be breached, increasing the flood plain in that area. The new levee would be several hundred feet back from the old one and would allow for new pools and vegetation along the river. Grange levee: Like the nine-mile setback levee, a new levee would be built about 8 miles upstream near the Skokomish Valley Grange Hall. The levee could be set back about 1,000 feet from the river, greatly expanding the flood plain in that area. Large woody debris: Creating log jams in the river would increase the complexity of the channel, adding meanders, gravel bars and pools. Such structure is considered important for the survival of juvenile salmon. Several dozen log jams are proposed in the initial plan, but that could change in the final design. Hunter Creek: Continual springs maintain summer flows in Hunter Creek, a tributary of the Skokomish considered excellent fish habitat. But with few side channels or complexity, the stream has limited spawning habitat and fish can be washed away during high flows. The project would alter the channel for better function. Weaver Creek: Similar to Hunter Creek, Weaver Creek has great potential for increased spawning and rearing habitat along with refuge from high flows. The project would alter the channel to improve natural functions. 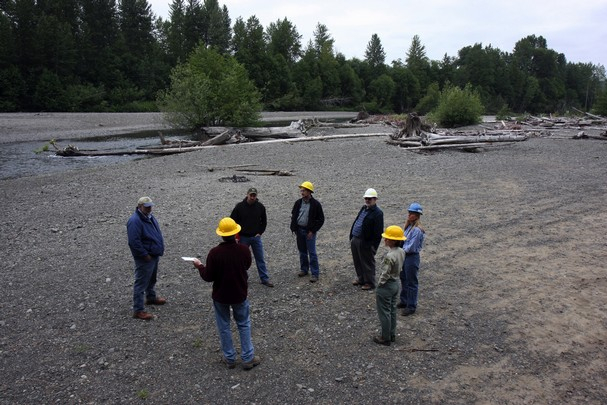 In 2009, members of the Skokomish Watershed Action Team observed how high flows in the Skokomish River had washed away vegetation and left huge deposits of gravel. Great News! Hopefully our government bodies can also discuss and mitigate the impact of annual illegal land use at Hunter Farms, as well as the impact of agricultural runoff. I thinks it’s great to fix the watershed but if we do not address the impact of what is in the water Hood Canal the shellfish located in Annas Bay will continue to suffer.